Hey folks, my name is Tristan Rodgers and I guide a visually impaired skier named Mac Marcoux on the Canadian Para-Alpine Ski Team. Mac grew up in Sault Ste Marie, and at age 8 was diagnosed with Stargardts disease, in other words, progressive loss of vision. He raced in the able body category until his vision no longer allowed him to, and his older brother BJ quickly stepped in as Mac’s first guide. I grew up skiing on a hill some would call Mont Tremblant’s baby sister named Gray Rocks. When I was a kid I fell in love with skiing around and going fast. By the age of 11, we were living in Ottawa full time and my father worked as ski school director in Wakefield at a ski hill called Edelweiss. Although I was playing competitive hockey full time, I would love to hang out with my friends in the race club and follow my childhood hero, Mikaela Tommy, as she trained with her older brother Duncan. I was a late bloomer in the ski racing world, and at age 14 I entered my first ski race. Though I was never part of an elite team, and with my father as my coach, I worked my way up the ranks until last spring when I got news that Mac’s current guide Jack Leitch would be retiring. When I was presented with a chance at guiding Mac, I jumped on it and the next thing I knew we were carving up some turns and enjoying beautiful sunshine in Mt Hood, Oregon! Many ask me if guiding Mac is difficult, to which I answer: “Imagine you’re skiing normally, but you say everything you’re doing and seeing. That’s kind of what it’s like! It’s life changing”. He can see me, and the gates when he skis. However, he needs a guide when the visibility is bad, mostly in the speed events where the gates are separated by sometimes 100 meters. We communicate using headsets attached to our helmets. When I was contacted and asked to try out as Mac’s guide I was absolutely ecstatic. I had never skied with Mac before, but respected him so much as a person and an athlete. Our styles of skiing are very complimentary, and my strong technical ability allows me to be very consistent on the snow. He was always a hero for me, and getting the chance to work with Mac was something I could never pass up. I was also approaching the end of my ski racing career, and looking for a way to give back to the ski racing community that had provided me with so many amazing memories, and lifelong relationships. My biggest concern about embarking on this journey was the year-round commitment, and the fact that I could not continue my studies in mechanical engineering at the University of Ottawa. After many reflections and conversations with my friends and family, I decided that I wanted to be a part of Mac’s journey. 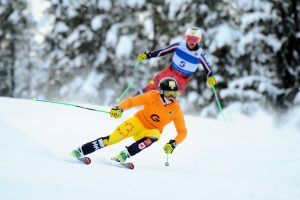 Although we had never skied together, I respected him so much and wanted him to have success, and truly felt like my passion for ski racing could elevate him and the team to achieve greater success leading up to the 2022 Paralympics. Sure enough, I have had so many amazing experiences so far, and am so excited for what is yet to come. After just a few days in Mt Hood, I knew that this was what I wanted to do for the next four years. I LOVED guiding and had such an amazing time with my teammates and staff. When the coaches had decided I was skilled enough to guide Mac for the world cup season, we travelled to Valle Nevado, Chile, in search of the best off-season training available. Training at a whopping 3000 meters altitude was difficult at times, but the breathtaking views made up for it. Valle Nevado was the most beautiful place I had ever trained, and the fact that this was the first time I had ever skied during the summer made this training camp even more special. When our camp had come to an end, I had officially been named Mac’s new guide, and was looking forward to the season ahead. Following our Chile camp, we travelled to Saas-Fee, an iconic training venue located in the Swiss Alps. As a ski racing fanatic, this training camp was extra special. We got to train on the glacier alongside the best ski racers in the world who were all there in preparation for the first world cup race of the season in Sölden, Austria. My favourite part of this trip was riding the TBar with Norwegian legend Aksel Lund Svindal. When I introduced myself, he told me he had heard about Mac and found him extremely impressive. I told Aksel Mac was hoping to go on his third year undefeated in the downhill event, and he wished us best of luck in doing so. After a tough but fruitful training block in Saas-Fee, it was time to return to our home base in Panorama, BC for some training and the first races of the season. It was while warming up for the slalom event that Mac fell on his hand and tweaked his back. I have now been at home training in Mont-Tremblant for the past month or so, ensuring I stay fit for Mac’s return to snow. In the meanwhile, I have been doing some FIS racing and volunteering at the Kimberley Alpine Center in Kimberley, BC as a course crew member and forerunner for the U16 races and speed camps. I am unsure when Mac and I will return to competition, but I am so excited to be reunited with him and the team.